Though Kuta is where the action is, Seminyak is where the beautiful people hang out. 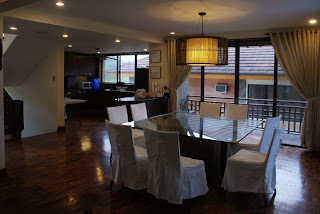 Yes, the high society who stay in luxurious villas end up making Seminyak their home base. Thus, the neighborhood has a lot of pretty restaurants, bars and boutiques. 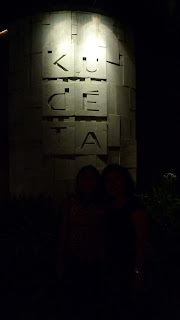 But if you have to go to one restaurant in Seminyak, it must be institution that is KuDeTa. 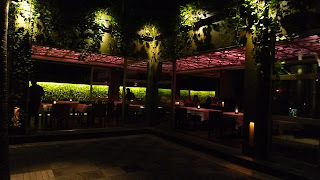 KuDeTa has been around for a long time, and it has been awarded several accolades for its food and dining experience. 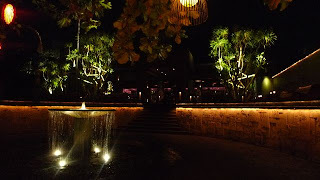 It is also a frequented spot for party goers in Bali. It's one place where celebrities lounge and pass the time with a drink of their favorite cocktail at hand. Well, KuDeTa is indeed exclusive, and thus, the prices are expensive. 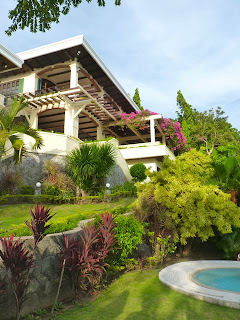 However, being food adventurer as well, I didn't care about the price anymore (the cheapest dish, a starter, is P500), and just hoped that the food would be at par with the dazzling ambience. 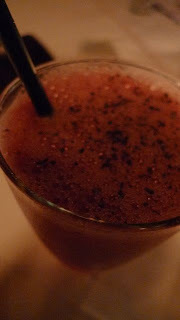 We tried a watermelon smoothie with black pepper. Though the spice was unique to the taste, the watermelon drink wasn't as refreshing as I expected it to be. I will try my best to describe the dishes we had, since we had the meal almost 3 months ago as of this writing. 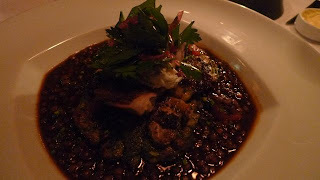 The first dish below is the Slow Cooked Chicken with vegetable lentils and spiced labneh. The chicken was tender and almost melted in your mouth, but the lentil sauce was so rich, it had an overpowering flavor. 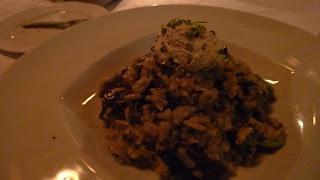 We also got a Mushroom and Braised Leek Risotto with truffled mascarpone and broad beans and lemon thyme. This was perhaps the simplest dish served. It was full of flavor, and I enjoyed tasting it. But I had better risotto, particularly the Seafood Risotto in C! Italian Dining in Clark. 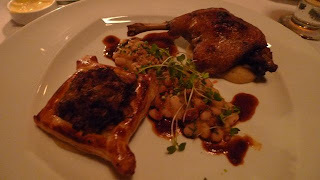 The Confit Duck Cassoulet was the best dish of the night. It came with a duck and foie gras tart that was heavenly. It had an apple puree and thyme jus that even enhanced the flavors of foie gras. I couldn't help but take small bites from the plate. My dish was the Miso Alaskan Black Cod Nobu Style. 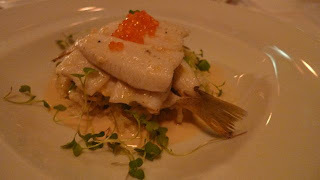 It was topped with flying fish roe. Since it was a Japanese dish, the taste was distinct and refreshing. I loved the way the fish was steamed as well, since it retained all its natural juices. Now, for the highlights of the evening meal. First of is the Double Valrhona Mocha Chocolate Tart. 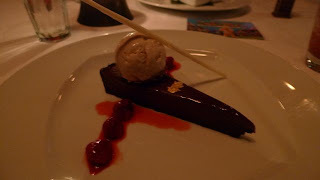 It came with cinnamon ice cream and topped with a gold leaf. A raspberry sauce also adorned the plate. The richness and bitterness of the dark chocolate was perfect. I couldn't help but compare it with the great valrhona cake served in Cav. 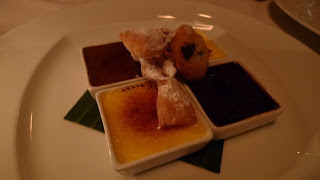 But the star of the night was this unexpectedly amazing dessert: the 4-Way Brulee - mocha, vanilla, chocolate and orange. When the dish arrived, I tasted each flavored brulee individually. Then, I began to savor them one after another in a particular order - mocha first, then vanilla, then chocolate, and finally a teaspoonful of orange. It was pure heaven. I told my mom to do the same thing, and she swore by the experience. A seemingly simple dessert made extraordinary just by eating it in a certain manner. I was happy I experimented. We were so tempted to order another one, but our bill was already way off the roof. 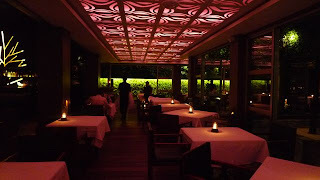 What makes KuDeTa special is the ambience. We arrived at almost 10PM, so there were a few people left having dinner. Most of the guests were out in the lounge areas and at the beach front having drinks. The place played suave chill out music courtesy of their world renowned in-house DJs. I can never get enough of the dining experience that we had. 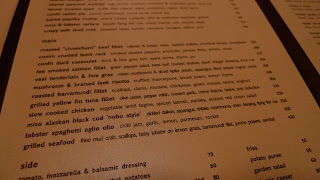 It was our first dinner in Bali, so KuDeTa really made our trip worthwhile. Though we paid a hefty price (and yes, I know it's a cliche), the experience was priceless. KuDeTa takes its cuisine to the next level by presenting it in such a mesmerizing way.